Is there a role for golf car type fleets off the course and in the urban centers of the future? Can-Am Defender HD5 is new for 2017 and features a mid-size engine and lower price point. VALCOURT, Quebec, Canada, Oct. 26, 2016– BRP (TSX:DOO) has expanded its line of Can-Am Defender utility-recreational off-road vehicles with the launch of the new Defender HD5 side-by-side vehicle. The Defender platform is now available with a mid-size engine, offering both value and performance while maintaining the Defender vehicle’s highly touted tough, capable and clever design. The 2017 Can-Am Defender HD5 side-by-side vehicle is every bit as tough as its larger siblings. The Rotax HD5 engine has been calibrated to supply excellent power and torque for work on the farm and in the field. The engine requires no break-in service and remains maintenance-free for one year or up to 1,865 miles (3,000 km) or 200 running hours. Additionally, the durable CVT comes equipped with engine braking, drive belt protection and a work-ready low range as standard equipment. 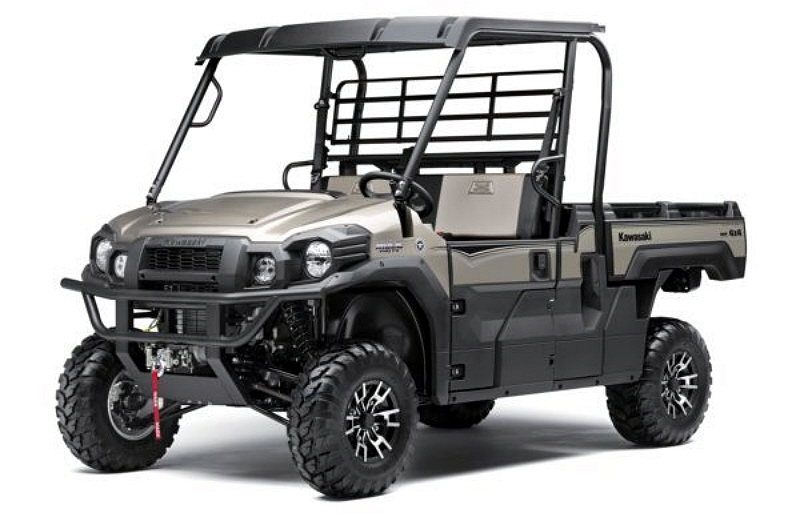 The Defender HD5 side-by-side vehicle is equipped with a dependable high-strength, low-alloy steel chassis. A double A-arm front suspension, unique Torsional Trailing A-arm (TTA-HD) rear suspension and twin-tube, gas-charged shocks supply 10 in. (26.7 cm) of travel, front and rear. The Can-Am HD5 side-by-side vehicle also has a 10.5-inch (26.7-cm) ground clearance, selectable 2WD / 4WD Visco-Lok auto-locking front differential and 25-in. (63.5-cm) Maxxis tires on 12-in. (30.5cm) wheels for superior off-road capabilities. The Defender HD5 side-by-side vehicle also delivers impressive capacities, with its ability to tow up to 1,500 lbs. (680 kg) and a payload capacity of 1,200 lbs. (544 kg). The heavy-duty cargo box has intuitive adaptability to go with its 600 lbs. (272 kg) rated capacity, tilting bed and fully functional tailgate. It also has the industry’s largest fuel tank, at 10.6 gal. (40 L), meaning more time for work and less time spent refuelling. A roomy, intuitive cockpit is designed to be fully functional and comfortable with cab pillars pushed forward, an open-dash configuration and a truck-inspired VERSA-PRO bench seat that accommodates up to three adults and flips up for added space in the cab. The Defender DPS HD5 package features up to 10.4 gal. (39.5 L) of onboard storage with its cup holders, under-dash storage and industry-exclusive, water-resistant toolbox. The cargo box presents additional usefulness with its integrated design elements like the LinQ quick-attach system, built-in anchors and tie-down points and many recesses for easy box separator solutions. 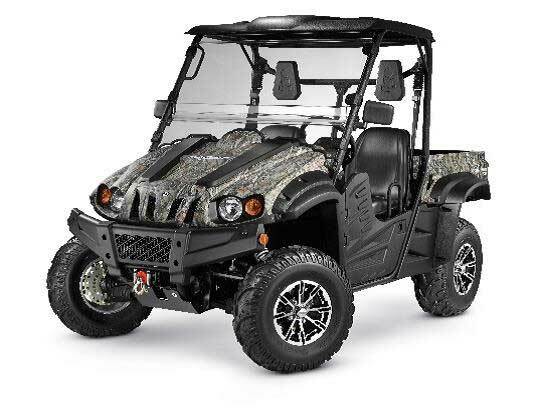 The 2017 Defender HD5 side-by-side vehicle is available in two packages (base and DPS) and up to three available colors, including an optional, water-dipped Mossy Oak Break-Up Country camo finish. 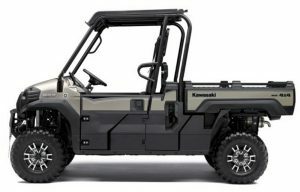 The Defender family of side-by-side vehicles is also highly adaptable with a line of 160 genuine Can-Am accessories, giving owners numerous customization choices. The tough, capable and clever 2017 Defender HD5side-by-side vehicle is an exceptional value complete with full-size accommodations designed to improve comfort and convenience for simplifying tough jobs. Comment: This is another example of a continuing trend in the side-by-side market of new value priced models being introduced. The slower growth in the overall side-by-side market and the rise of less expensive smaller brands has led a number of the larger brands to launch lower priced models around the $10,000 price point. With an economy that looks like it will continue to grow relatively slowly and weakness for side-by-sides in oil/gas and agriculture segments, the move to bolster lower priced offerings is likely to continue and competition could become fiercer in the $8,000 to $11,000 price range. 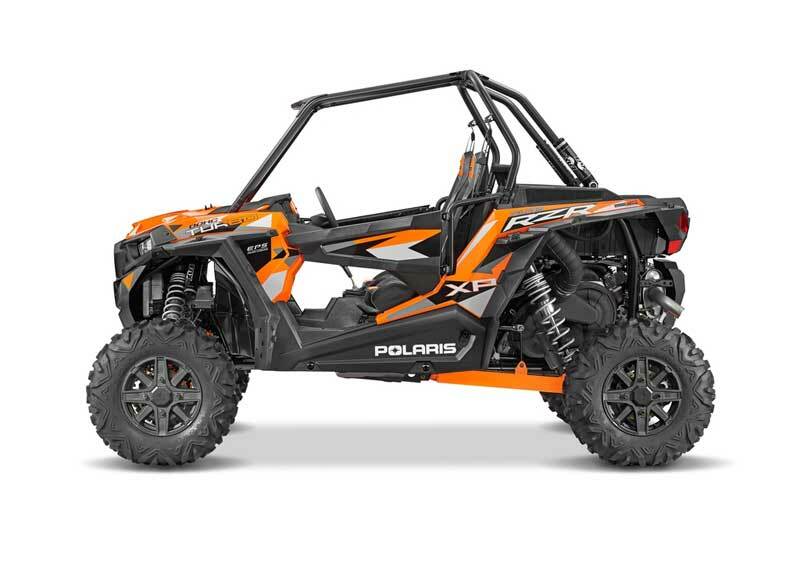 Recalls of vehicles like the Polaris RXR XP Turbo were a drag on the company’s financial performance for the quarter. Polaris Industries announced their financial results for Q3 2016 with third quarter sales down 19% to $1.18 billion as impacts of massive vehicle recalls are still being felt. CEO Scott Wine stated that the company is prioritizing “…recall execution and quality validation and delay the launch of many of our model year 2017 Off-Road Vehicles.” The following are highlights from the earnings call as they relate to the small, task-oriented vehicle market. 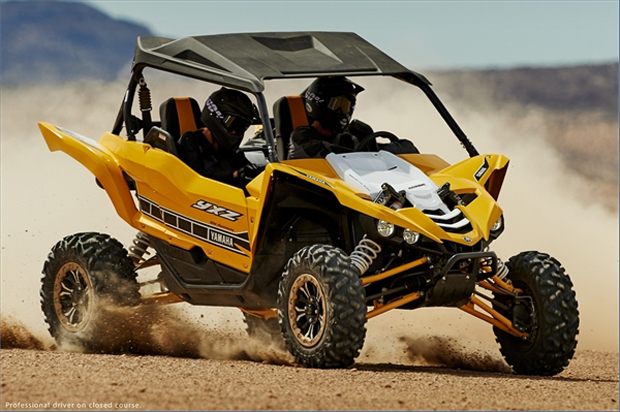 The Yamaha YXZ1000 targets the “pure sport” side-by-side segment, with an eye toward dune riding. Yamaha introduced the YXZ1000R in September of 2015. The launch marked Yamaha’s entry, or some would say re-entry, into the pure sport segment of the side-by-side market. The YXZ1000R was the first side-by-side with a manual 5-speed sequential-shifting transmission as opposed to a CVT. The vehicle is powered by a 998cc liquid-cooled DOHC inline three-cylinder and produces about 112 HP. YXZ1000R also features FOX 2.5 Podium shocks and a boatload of suspension travel. (Full specs) For drivers less experienced with a manual transmission, a Rekluse clutch option is available so the clutch pedal does not have to be used. For 2017 the base model and the SE models remain essentially the same except for some body color changes. The biggest addition for the 2017 model year is the SS variation that has paddle shifters, which avoids the need for using a clutch pedal while shifting. As is noted in the review comments, the original YXZ has more appeal to drivers with manual transmission experience. The paddle shifters should widen the appeal of the YXZ to riders with more varied driving experience. With the importance of Yamaha’s entry into the sport segment and unique manual transmission, there are quite a few expert reviews of the YXZ1000R. Most of the reviews are based on day long test drives. The following are some of the key comments from individual reviews. UTVUnderground.com – Day long test drive in dunes at Glamis. From the outside the YXZ isn’t the most appealing UTV on the market. The seating position is the best of any UTV I have driven. The seats lean back and are comfortable. Overall the interior is good. The design of the YXZ is unique – particularly the hood design which gives a different feel while driving than other UTVs. Rear Suspension – The lower arm is much like a trailing arm but unlike what you see on a RZR or Wildcat it also has an upper control arm which really helps the rear of the car to stay stable and planted to the ground. Rear wheels feel planted and there is minimized body roll. The ride may be considered stiff. Handled all of the riding conditions encountered. 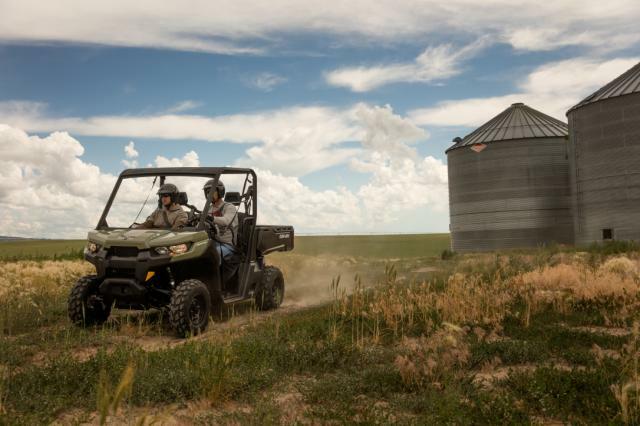 The torque felt great; shifting allows the driver to deliver the power where they need it and while it can be tricky to remain in the right gear, once you master it you can control the YXZ unlike any other UTV on the market. You really need to run it up in the RPM to get the most of it, especially in the dunes. The 5-speed gear box was what I was most impressed with on the YXZ. I had been expecting a very loose feeling shift and weak clutch but what I got was a real performance minded feeling of a tight shift and instantaneous engagement. You can’t really up the size of your tires without drastically reducing your performance. The Yamaha is very limited as it pertains to setting up for other types of riding, it was designed to be a pure sport desert machine. While it will be tricky to drive for the average Joe, for anyone with any sport or performance driving / riding experience, they will love the YXZ! We drove 20 plus units with over 500 miles on them and not one machine was towed in or broken at the end of the day. Dirtrider.com – Day long test drive in dunes at Glamis. This reviewer comes from more of an off-road motorcycle background. There is a built in safety light that will tell you to shift when absolutely necessary. In 2nd gear you’ll climb the steepest dunes, 3rd gear will lug around most open trails and 4th and 5th are for blasting whoops and racing friends. Gas pedal reach may be an issue for shorter riders with the stock adjustable seats. This isn’t the best option as a family rock-crawler. UTVDriver.com – This test drive involved the YXZ1000R SE which had Silver Metallic and Blaze Red Metallic painted exterior and interior with color matched seats, A-arms and beadlock rings. 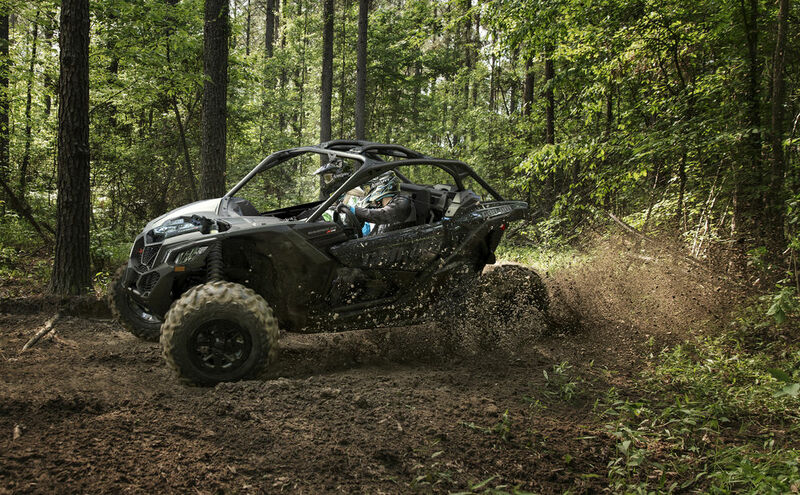 The exciting YXZ experience is more like riding a sport quad, but it takes much more effort than a CVT-equipped High Performance UTV. The Rekluse clutch prevents the YXZ from stalling when coming to a stop. It has no effect on shifting whatsoever. The Rekluse clutch is a great purchase for new drivers or those spending their time rock crawling, mud bogging or on tight woods trails. Brakes as good or better than anything currently on UTVs. The engine braking and manual transmission helped on downhills. The vehicle was stable and predictable. YXZOwners.com – These comments are a summary of a long discussion on a YXZ owners forum about the clutch and manual transmission of the YXZ. The machine can handle other terrain besides dune and desert like tight trails, rocks and mud with some driver skill. A less experienced driver may ruin the clutch before its time. Zerk fittings, properly routed wires, lines and cables, the fit and finish on this machine takes it to the head of the class from the get go. I found the YXZ to shift as easily and positively as any manual transmission I’ve ever operated. Stiff suspension with factory settings but adjustments can be made. Feels planted and rode better at higher speeds with little body roll. Front locking differential worked well on technical climbing sections but the YXZ requires more skill and effort to operate in these conditions than a UTV with a CVT. The manual transmission is good for downhill runs. I can’t emphasize enough how much better the YXZ handles downhill runs with it’s manual transmission, it’s a huge plus. Shifting is a huge part of what makes the YXZ so much fun to drive and make no mistake, Yamaha’s flagship sport UTV is a seriously fun machine to operate. Lanesplitter.jalopnik.com – Review of YXZ1000R after day long test ride in desert conditions. Driving in the sand with a real manual transmission adds to the experience in a special way, allowing you an entirely new level of control. Some heat coming from engine and transmission when pushing it. User Review – This is a user generated video. They take the YXZ1000R out for a short ride in a gravel parking lot. User Video – No comments, just a video montage of theYamaha YXZ 1000R in action on various terrain. In August, 2016 Can-Am introduced their new Maverick X3, the latest salvo in the battle for supremacy in the sport/high performance recreational side-by-side market. Continuing the horsepower wars, this latest model is powered by a 154 hp, three-cyclinder, 900cc, turbocharged Rotax ACE engine with EFI. It delivers 113 lb-ft. of torque at 7,000 rpm and propels the X3 from 0-60 mph in 4.9 seconds according to Can-Am. Another key feature of the lineup is the large amount of suspension travel, from 20″ to 24″ depending on the model. 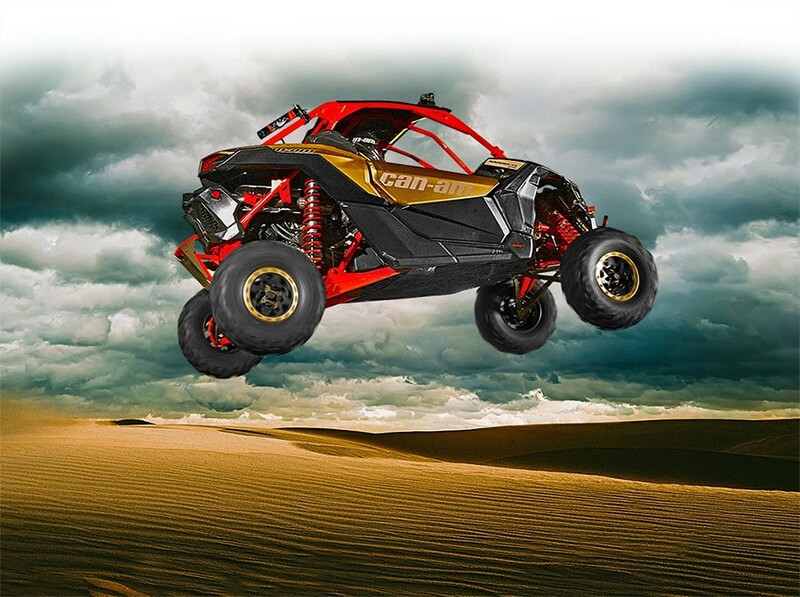 Besides the base model X3, there is Maverick X3 X ds and the top-of-the-line Maverick X3 X rs designed for dune riding. The MSRPs are $22,999, $24,999 and $26,999 respectively. The following are some of the key impressions from the reviews. Some of the reviews were based on a limited test run at a dealer event, while others were based on a lengthier one or two day events with many hours of riding. UTVguide.net – Extended test of the Maverick X3 X rs at UTV Invasion event in Idaho. The torque is silky-smooth, allowing you to drive hard with your right foot while still maintaining traction easily under hard cornering loads. UTVGuide.net – Tested all three Maverick X3 models in Mexico over two days. CVT and engine intakes are behind the driver’s head which may be annoying after several hours because of the noise. The front differential lock is not good for rock crawling. ATV.com – Short test run at dealer event. The power literally puts you back in your seat if you stab the throttle pedal hard. Can easily adjust to the three compression settings on the shocks. Like with the other X3’s, the car feels planted, tracks straight and is ultra plush. 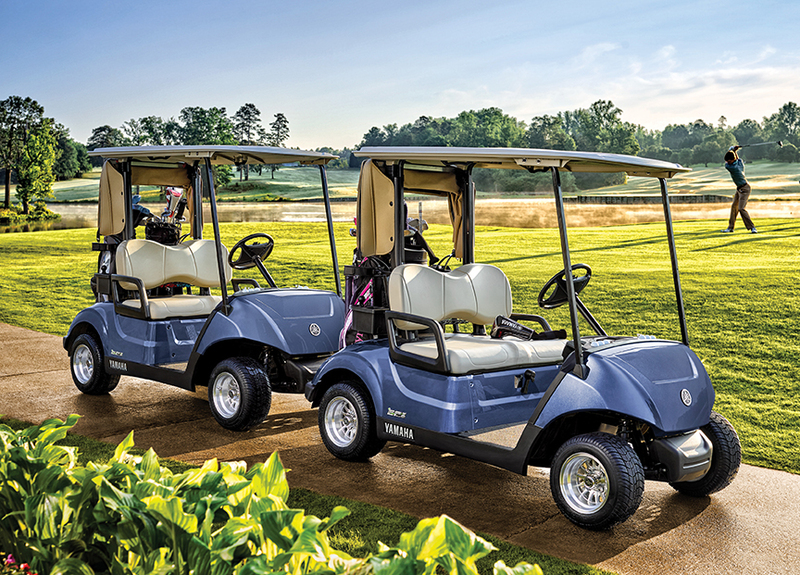 Handles rough terrain very well and the driver feels in control. The vehicle has some chassis roll. The CVT is noisy in the cabin and you will need to replace the transmission belts occasionally. Ridenow TV video – The 2017 Can-Am Maverick X3 review was the topic of this week’s RideNow TV episode. We had an exclusive opportunity to have first dibs at test riding the Maverick X3 before they were available to the public and we had an absolute blast! 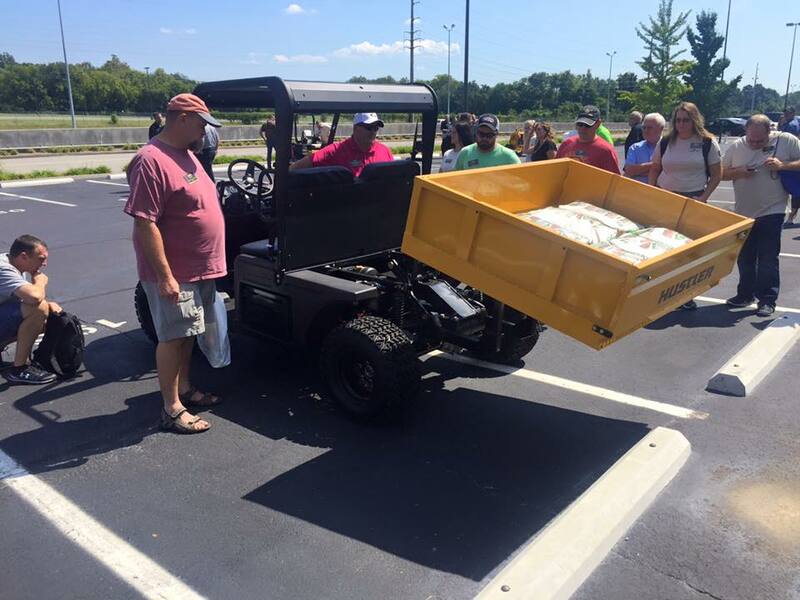 Every single one of us was extremely impressed at the over all package delivered by Can-Am. Used a new high strength alloy to make a lighter but more rigid frame to handle the high horsepower. The 4ekolka, a prototype electric powered city car. The 4ekolka is a 3D printed, electric powered vehicle out of Prague from Petr Chladek. The estimated cost to build this prototype vehicle was $12,000 with half of that for the batteries and battery management system. The vehicle is designed for a top speed of 55 km/h or approximately 34 mph. The 9.6 kWh battery pack consists of LiFePO4 batteries with a capacity of 200Ah @ 48V and the estimated range per charge is 200 km or 124 miles. The 4ekolka is expected to consume about 100 Wh compared to 200-300 Wh for most electric vehicles. The Maverick X3 X rs package is designed for riding the dunes or occasionally above them. An article in PowerSports Business provides some details of the product development process for Can-Am’s recently launched Maverick X3 side-by-side. The process started from scratch and early on the company researched trophy truck, sandrails and dune buggie markets for design input. Side-by-side users have been migrating from these markets. 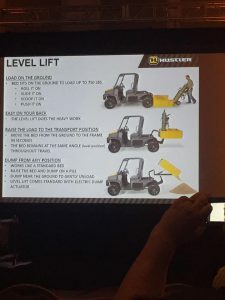 Based on this research, Can-Am engineered a large trailing arm and up to 24″ of rear suspension to the Maverick X3 lineup. The wider 72″ X3 model will also appeal to the dune riding crowd. Another critical design element is the low center of gravity for the passengers. The overall design revolved around the words defiant, precise and powerful. Since the X3 was positioned as the top of the product line vehicle, Can-Am wanted it to be a statement vehicle with an aggressive and bold look. Precise refers to the suspension and handling characteristics and powerful refers to the turbocharged engine. 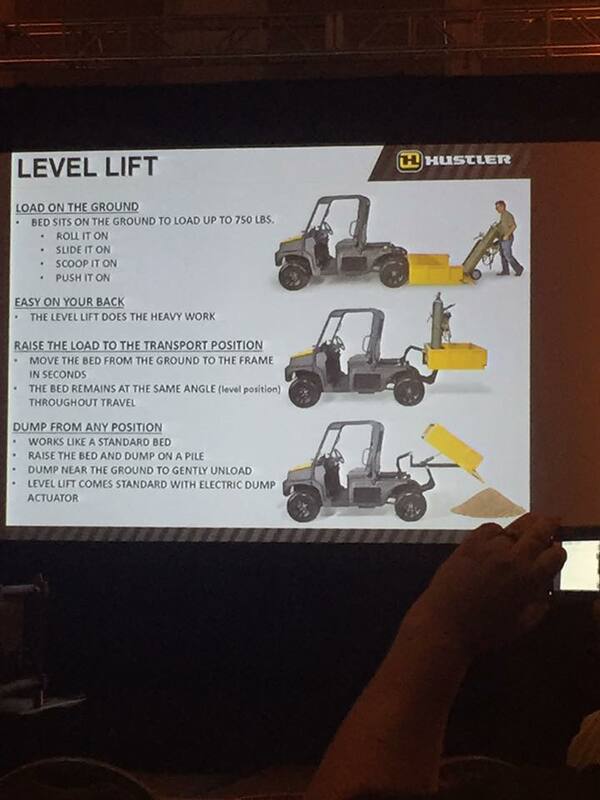 Cub Cadet introduced their Challenger UTV line in early 2015 with the Challenger 500 and Challenger 700 models. The models are similar with the main difference being a larger sized engine in the 700, 686cc vs. 471cc. The models are positioned as offering excellent value for the price with a host of standard features including a hard-top roof, quick-release windshield, winch with remote, alloy wheels and digital display. The MSRP for the Challenger 500 is $8,499 (see model specs) and the Challenger 700 is $9,499. SVR interviewed the Marketing Director and discussed at length the new Challenger line and future development plans. The Challenger 700 can reach speeds up to around 60 mph in high gear and above 40 mph in low gear but can take time to reach those speeds. The transmission and 4WD worked well with quick engagement and smooth operation. It corners well in 2WD but steering gets heavier in 4WD without EPS. The relatively short wheelbase and torsion bars are good for tight trails. The relatively low 7.3″ of suspension travel limits it ability on more challenging terrain but it handles typical trail obstacles satisfactorily. Very strong brakes for steeper terrain. Good ergonomics in the cockpit and nice creature comforts. Overall, they seemed to have pushed the Challenger 700 hard and came away with a positive impression for the vehicle. There was limited user generated reviews but I did find some comments on a UTV forum. Overall the two users seemed satisfied with the Challenger 700. A-arms needed to be greased upon first purchasing. Exhaust valves needed to be adjusted. Top speed of 55 mph reported. The hitch is “quirky” because of existing pin hole placement. If you are looking to purchase this model please note that Cub Cadet recalled some of these vehicles in early 2016 because of an issue with the parking brake cable failing. If you have had any experience using this vehicle, please leave a comment below. 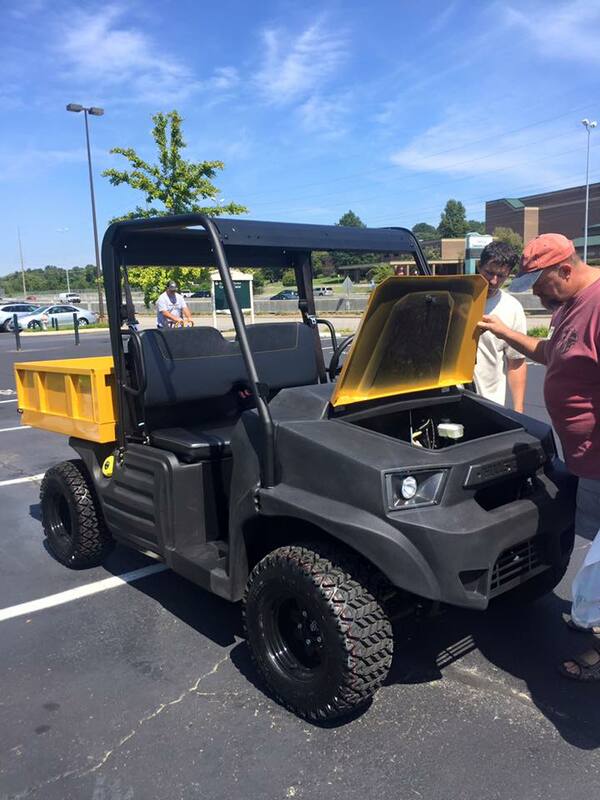 The new MDV utility vehicle from Hustler with a unique cargo bed technology. Photo: Pinkston’s Inc.
More information on the Level Lift technology used in the Hustler MDV. Photo: Pinkston’s Inc.
A frontal view of the Hustler MDV. Photo: Pinkston’s Inc. Comment: This is another example of a power equipment company trying to take advantage of their unique distribution network. The turf and lawn care UTV market is seeing big name UTV brands using partnerships and contract manufacturing deals to reach this market, as well as, outdoor equipment brands develop their own products. It will be interesting to see how the level lift technology does in the market and whether other manufacturers will develop something similar. It could be popular in larger institutional or other settings where there might be interest in trying to limit work place injuries due to lifting cargo in and out of vehicles. Kawasaki expands their Mule Pro-FX line for 2017 with a Ranch Edition model. A side view of the new Mule Pro-FX Ranch Edition.